He's done it! Professional origami artist Sipho Mabona has created a huge, life-sized elephant with just one sheet of paper. His most ambitious work to date, the elephant took Mabona and a team of over a dozen people four weeks to complete. Standing just over 3 meters high (or 10 feet tall), the work is now on display in the museum KKLB in Beromünster, Switzerland. Mabona financed the project through Internet-crowdfunding site Indiegogo where he raised over $26,000 from 631 funders. A webcam was installed that allowed people to watch the massive elephant take shape. 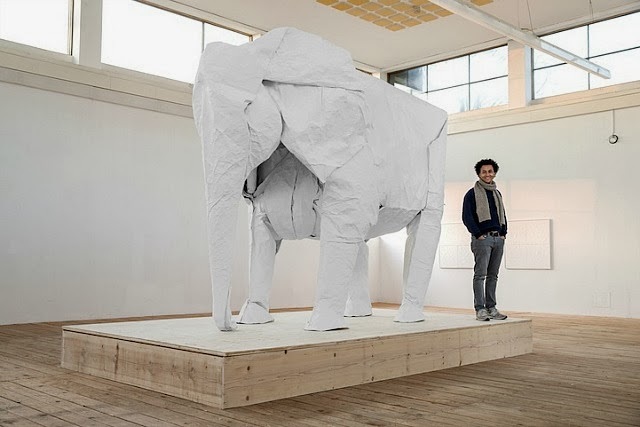 The artist ran into some major challenges like figuring out how to spread a huge sheet of paper, measuring 15 meters by 15 meters (or 50 by 50 feet), in a hall, to transform the sheet of paper into the body of an elephant. Also, there were moments during the folding process, when he had to get the help of up to ten people to lift and fold the paper.